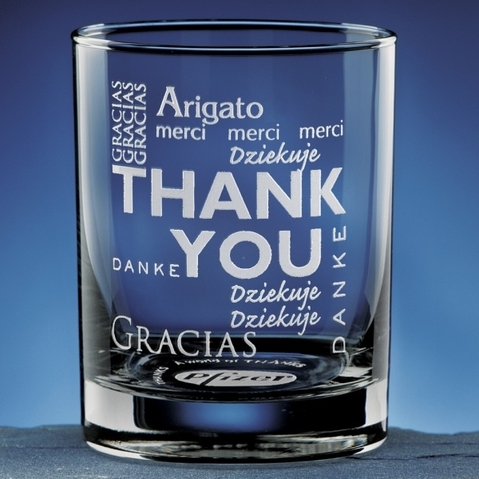 Express your gratitude with this set of glasses that says it in a multitude of languages. Each glass in the set highlights a different language surrounded by thank-yous in several other languages. As one finishes their beverage, they are greeted by your logo and the message �a world of thanks� on the bottom. Of course you can always do a message of your choosing if you prefer. The set of four includes English, Spanish, Japanese and French. The set of six includes the previous plus Polish and German. Other glasses may also be available with the Gratitude designs.